I pre-ordered Running on Empty - An Ultramarathoner's Story of Love, Loss, and a Record-Setting Run Across America written by Marshall Ulrich (Foreword by Christopher McDougall) on February 28th. 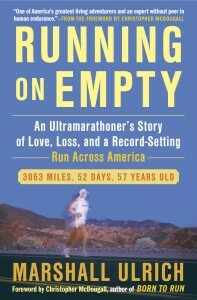 When it arrived almost two months later on April 16th, I immediately immersed myself into it, finishing this well-written, easy to read account of Ulrich's epic run across America in 2008, in 100 mile "sub-24 hour" fashion. That is how attention-grabbing Ulrich's account is. I loved it. I had a very particular interest in reading this book, (one Ulrich actually alluded to in a post about a week ago) and, my review of it is most likely semi-skewed toward that interest. Let me explain. I have seen Running America, a documentary film that follows renowned ultra runners Charlie Engle and Ulrich on their attempt at a record breaking run from San Francisco to New York City (Ulrich would complete the journey, setting both a masters and grand masters record for such a crossing; Engle would succumb to injury after nearly 18 days), and have read various posts and commentary touching on Engle's storied past (his battle with and conquer of drug and alcohol addiction) and troubled present (Engle is presently serving a 21-month sentence in a Federal prison after being found guilty of 12 counts of bank, mail and/or wire fraud), including a somewhat interesting and heated exchange of comments to Scott Dunlap's blog post titled, "A Trail Runner's Blog: Charlie Engle's "Fraud-Funded" Sahara Run - Will He Get 111 Days In The Slammer." I have also had the honor and privilege of sharing the road with both Ulrich (in 2009 and 2010) and Engle (in 2009) at the Badwater Ultramarathon, where they both took the time to provide me with insight and encouragement. I have spoken and corresponded with, and seen them both outside of the realm of ultra running (Engle as recently as a month ago, and Ulrich during a training visit to Colorado last June when we met up at one of Lisa Smith-Batchen's "Running Hope Through America" 50-mile runs, and just yesterday when we corresponded via Facebook). Running America was, in my mind, extremely deficient in detailing the interpersonal relationship between Engle and Ulrich (and their respective crews) during their time together crossing America, and I was very interested in Ulrich's account of how an epic journey such as this could lead to the degradation of his relationship with Engle. Ulrich writes, "the passage of time has allowed me to get a greater sense of why things went south between us, why we couldn't be friends when it all was over. We could analyze his character and mine, pick apart every action and decision, dissect every conversation, speculate on every motive, but it all boils down to one, essential thing: the miles." Having myself spent 8 days running through the mountains of Brazil with two friends, Jarom Thurston and Chris Roman, I felt as if I had some understanding (although on a much, much, smaller scale) of what it takes to spend multiple days trying to cover a distance with other runners, and how that experience can impact the preexisting relationship. Opposite of the Engle-Ulrich experience, mine served to strengthen my bond and friendship with those two individuals. So, in reading this book there was a part of me that purely wanted it to provide insight into, and one person's point of view of, what might have gone wrong between these two friends. It certainly did, but, Running on Empty turned out to be much, much more. The book grabs you right from the start with a heart wrenching discussion of Ulrich's first wife Jean's battle with and death from cancer, and how, as I took it, her death not only immersed Ulrich with despair and fear, but also drove him to become the "zen master of extremes." I particularly enjoyed how Ulrich filled in the monumental gaps I was left with after watching Running America, not only with respect to his interactions with Engle, but also with respect to various other aspects of his journey, from his preparation for the trek, to his struggles with injuries and other ailments, including a dislocated fibula, tendon tears and severe plantar fasciitis. In various appendixes Ulrich shares portions of his training schedule (created for him by Canadian ultra running legend Ray Zahab), a day-by-day account of the course statistics, his nutrition and diet, the supplies, clothing and gear used, and details about the injuries, ailments and treatments experienced and received along the way. I was pleasantly surprised to see this information included, and before even getting into the meat of the story itself I read and re-read the training schedule appendix. On the Engle-Ulrich drama, it was pervasive throughout the book, at least until the 8 pages (184-191) that detailed how "everything came to a head on October 21, day thirty-nine of the run." The remaining 50+ pages (the book, sans appendixes is 253 pages in length) are scant of mention of any interaction with Engle. At times I felt as if the book was more about the issues with Engle than anything else - the index seems to have more mention of Engle than any other topic, including a slew of "conflicts with" references (pages 152, 157-58, 176-78, 184-91, 194, and 205). However, at the same time I felt myself wanting even more details about the destruction of the friendship. It was also interesting to learn that their troubles started well before the run. Ulrich writes that Engle's "braggadocio and craving for the limelight had begun to rub me the wrong way...he neglected to include me or even mention my name in most of the pre-race publicity and sponsorships, and he'd made promises he'd failed to keep...Heather and I had begun to joke that I was the 'invisible man'." I felt that the book was lacking in just one area - I would have liked to have read more about the interactions Ulrich and his crew had with people along the route. The book does have a few passages in this regard, but I still was left with the feeling of wanting a bit more. Other than that, there isn't much to want. Ulrich provided exactly what I expected, and more - a succinct account of his record-setting run, the aspects of his personal life that led him to this point and that will continue to guide his future, and his personal take on a failed friendship. He writes with clarity, purpose, and desire, just as he lives his life. 1. Expect a journey and a battle. 2. Focus on the present and set intermediate goals. 3. Don't dwell on the negative. 6. Have confidence that you will succeed. 7. Know that there will be an end. 9. Be kind to yourself. 10. Quitting is not an option. Ulrich follows those commandments in Running on Empty, is brutally honest, real and straight forward. Whether his accounts of his interactions with Engle are true or not, the way he tells his story is riveting and provides a look at the good, the bad, and the downright ugly that can be associated with a 3,063 mile haul by foot across the country. After finishing the book today I immediately popped in my DVD of Running America, and I'm glad I did. I watched it from a different perspective and found that I enjoyed it even more than the first 10 times I watched it, primarily because I felt I now knew part of the story that Running America failed to convey. I am no more of a Marshall Ulrich fan, and no less of a Charlie Engle fan, than I was yesterday. I have the greatest respect for the physical and personal accomplishments of both of these fine athletes, and continue to call them both friends. There are two sides to every story. Things happen. People grow apart. Some friendships just don't last forever. But, what I am is tremendously happy that Ulrich chose to give us his no-holds-barred account of this 52-day experience, and I'd surely recommend giving it a read.